Gloucestershire Police are today investigating a claim from a Mr Wise, originally a cockney barrow boy, but now giving his address as West Yorkshire, that three points were removed from his grasp in or around the vicinity of Whaddon Road yesterday afternoon. Mr Wise claims to have just taken his eye off the points for a second, when they were snatched away, and says the culprit appeared to have a scouse accent. However, the police have since interveiwed 7043 witnesses who state that in fact the points were not stolen, but given away by Mr. Wise, who allowed them to be placed into an area of the field where he had just removed any semblence of a co-ordinated midfield, and from where they were seen being kicked into any empty onion bag, while the designated security guard (one David Lucas) was elsewhere. With many new owners coming into the English game, either on a strictly for profit plan (such as the American buy-outs of Liverpool and Manchester United) or for who knows what motive (as at Chelsea and Manchester City), the question of who owns football clubs has never been more openly debated. Platini has seen fit to comment on this as well, although he has said nothing specific, just added to a general paranoia against foreigners. The most intriguing change in ownership is that of Blue Square Conference club Ebbsfleet United, (previously known as Gravesend and Northfleet). It has been agreed that a 51% share in the club will be bought by the web site, Myfootballclub.co.uk, when the deal has gone throw, the members of the web site will effectively own the club. However, the intention is not just to have these shareholders appointing the executive as generally happens with limited companies. Instead they will have a say, via on-line polls into every aspect of running the club, including the choice of the team each Saturday. At least 20,000 people have signed up, paying £35 each for the privilege, (with 21% going on administration costs, I think the web site owner is making a small fortune somewhere along the line). Many of the existing support are not surprisingly suspicious of the deal, while I think the administration probably see this as £500,000 of new money, with an idea that will soon be forgotten, leaving them to run the club much as before. (Ebbsfleet may also be considered a poor choice by some of the people who have bought in  the original aims of the site said a club capable of reaching the Premiership, with Leeds United topping the members poll of clubs to approach). I cannot guess who this one will work out, but I will keep an eye on it and report back later. The Perils of Platini – Part 2. After the World Cup draw, we wait another week for the next big draw  for the finals of Euro 2008. This will be the end of a big week in European Football, as not only is there another series of games in the Champions League and UEFA cup, but the week will end with UEFAs Executive committee delivering a verdict on the Platini plan to reform the club competitions. It appears however, that the plan has already been holed below the waterline after last weeks meeting of the European Professional Football Strategy Council. This organisation brings together representatives from UEFA, Clubs, Leagues and Professional footballers, and includes three Englishmen in its sixteen members. Geoff Thompson, (FA Chair/UEFA Vice President), Peter Kenyon (club rep from Chelsea) and David Richards (Premier League chairman). It cannot be co-incident that Platini had threatened to be less than fully supportive of Englands 2018 World Cup bid just before the meeting started. The piece of the Platini plan that has certainly been lost is the idea of allowing the cup-winners of 16 top countries to play a special qualifying competition with four places in the group stage at stake. However, it may still be possible for individual countries to choose to send cup winners instead of an extra league team into this qualification place. Rumour is that Italy, where the national cup is run by the league may choose to do so, whereas here in England, the FA do not have the power to push the Cup Winners above the fourth place in the league. What Platini will keep is an extension on the number of Champions automatically placed in the group stages. Currently there are 16 places directly allocated (10 Champions and six runners-up), but this will be increased to 22 (13 Champions, six runners-up and three third placed clubs). Platini wanted to separate the qualifying competitions, so as six of the ten qualifying teams had to be champions, the other four being from the Cup-winners section. It will still be an achievement for Platini if he can reserve the six places for Champions. The UEFA Cup part of the plan was to change from 8 groups of 5 teams with three qualifying from each to 12 groups of 4, two qualifying from each. This is logical and I would expect it to be carried through. In order to provide the extra dates, teams knocked down to the UEFA Cup in the last round of Champions League qualifying will go direct to the group stage. Platini has been publicly raging against the inequalities of the current system. These are two fold, the Champions League (but not the UEFA Cup) is earning riches that go in the main to those clubs in the group stages. These earnings allow the clubs that make it to this stage to be in a higher financial league than that of their league rivals. This has created an inequality and lack of competitiveness within many leagues, including the best in Europe. The earnings are not equally distributed between the clubs in the Champions League though, and those clubs from the bigger countries have a major advantage over the smaller nations based on both national and champions league earnings. I wrote to UEFA and asked what the plan to deal with these inequalities would be. The reply was that they had not decided yet. This is the battle yet to come for Platini. And again the trump cards are all in the hands of those clubs whose wealth may be affected by a Platini victory. In another move, Platini wrote to the prime ministers of every European state back in the summer, asking for special treatment for the sport in European treaties, (especially the current EU one that is under debate across the continent). There are a few lines about sport in the treaty, and Platini is actually claiming a victory. But those few (almost meaningless) lines fall well short of the standard Platini was asking for. Indeed, Gordon Brown openly said no to Platini within days of the original letter. What UEFA have been asking for is a position for sport that places it separate from other businesses, and allows it to at least negotiate to stand outside certain aspects of company law. The European Union would argue that in fact there are only around five major leagues in Europe (of which the Premiership is one). To not allow all European citizens equal rights to play for clubs in these leagues is a restraint of trade and will not be allowed. As we approach the second AGM of the Robins Trust, it is time to take stock of the project. Not surprisingly, that while the project is far from being an unmitigated disaster, it also has not been an overwhelming success. The question in my mind is whether the Trust has failed to live up to its potential due to failings of myself, and my fellow board members, whether other factors have kept us down, or whether my initial imagination of the potential of the trust was wildly unrealistic. Achievements. As an enthusiastic and fund raising organisation, the trust has been as good as any in the past, there has been the Sporting dinner, quiz and race nights, regular raffles and the Christmas parties. All those involved were very proud of the achievement of the sponsored cycle ride, while the Sponsorship for youth scheme is still well supported. As a result of this, we have raised enough money to pay over £10,000 for club shares, and added significant amounts to the youth pool and to charities. Membership Numbers. The membership number is currently around 170  and is showing a slow decline. This is equivalent to about 5% of the support the through the gate on any particular match day. In terms of the trusts other briefs when we started, (as opposed to the old CTISA), we have not yet achieved much  we have not really done anything to improve the clubs standing in the community, nor have we approached the business community in any significant way. In comparison with other trusts, we are ordinary. Some trusts boast around 30% of the regular support as membership, and have members of the football club board, but these have almost always come about through a financial crisis at the football club in question. As we have no desire to make a crisis out of any drama here. Most trusts of clubs that have not had to face any crisis appear to be of a similar size to our own (source, Football Governance Research Centre, Birbeck, University of London). Where do we go from here? It is quite clear that our trust is a critical point. The membership is in decline, and around half our initial board membership has left  without replacement. Several other board members, including myself would like to take a back seat for a while and let others take the lead. I think it would be advantageous if the trust board could take on some of younger blood and organise more events that appeal to the younger sections of the support. The most likely course over the next few months for the trust is more of the same, with similar types of funding raising events and regular raffles. In this case, I can see the overall membership levels continuing to decline. The fact that the football club appears to already be preparing for relegation at the end of the season means that the general mood will remain one of depression for the foreseeable future, but we do not have the crisis of the type that has galvanised support of other clubs into action. What I would like to see at some stage is a big push forward by the trust board, with a sudden rise in membership numbers. I still imagine a trust with over 1000 members  a figure that would make us a force to be reckoned with. I think a 1000 member trust would be able to force its way onto the board (not that there would be a great opposition here, so long as it was understood that certain details, like individual employees pay would remain confidential). A 1000 member trust needs a board of around 15-20 members (some could be sub-committees) in order to keep regular events going on  not just in Cheltenham, but in other towns in the area. It would be expected that a larger trust would have a larger influence on the community. I could see the Trust, and hence the football club playing a larger part in other events in the town. This is a festival town, with a series of festivals; literature, music, cricket and racing  there is no reason why the football club cannot be part of these festivals, and that the trust should be the key link. The trust started at just the wrong time for me, personally. I had been unemployed for a couple of months prior to start up, but I have been in near continuous employment since, and my employment has continually been over 100 miles from the football ground. I have my dreams of how a football trust could run for the benefit of all, and where the town pulled together to support the club  rather than asking the nearest single rich person to subsidise it. But, if I am being truthful, I know these are just dreams and here in Cheltenham, apathy will continue to rule. The first mention I can find of Cheltenham Town in the FA Cup results was for the 1914-5 tournament. However, this was the shortest lived of all cup runs  with no result recorded, and both ourselves and our opponents, Trowbridge Town managing to get disqualified without reaching the next round. In this article, most of our matches are in either the Extra Preliminary Round (XP) or the Preliminary Round (P)  there were then a number of further qualifying rounds (1Q, 2Q, etc) before the first round proper. With war intervening, it was not until 1919 that Cheltenham finally got a result on the board  not a particularly inspiring result, being as it was a 4-0 defeat at Chippenham Town. For the next decade or so, entry to the cup was patchy, results even more so. In 1920, we got through XP after a 2-2 draw with Melksham & Avon United, due to our opponents being disqualified, but then lost in PR at home to Trowbridge by 3-1. The following season we fell to XP defeat at home to Devizes, while in 1922-3  the season of the first Wembley final, we were missing from the competition. This may have been because we had just entered the newly formed Gloucestershire Northern Senior League, which had finally brought organised football to this area. Up to this point, teams in the area played in a number of local leagues, such as the Cheltenham league. Each league had a limited number of teams, but many clubs competed in more than one league, leading to frequent chaos with the fixtures. We were back at XP in 1925, when Union Jack (Bristol) continued our run of defeats, the score was 3-6, so maybe it was not a surprise we gave 1926 a miss  returning in 27 to lose the XP 3-5 at home to Warminster. Still, our league form was improving  as we became the dominant team in the league for the next few years, although we recorded only one title, compared to four runners-up positions. But although 1928-9 was the championship year for Cheltenham, it was a double disappointment in the cup, as we were drawn away to play Gloucester, and still lost, this time 2-1 (XP)  Gloucester went out 1-0 at Spencer Moulton, two weeks later. The next two seasons went by without Cheltenham entering the FA Cup. Finally, on 5 September 1931, at the start of our last season in the Northern Senior League, we went to J.S. Fry & Company, at the chocolate companys grounds in Keynsham and won an FA Cup (XP) match  not only that, we won it 5-0. This only kept us in the competition for two weeks, after which we travelled to Kingswood and lost 2-0, but it was a start. In 1932, we moved into the Birmingham Combination, a professional league requiring far more travelling. We had a successful first season, finishing 3rd behind Redditch and Birmingham A, while our reserves replaced the first team in the Northern Senior and won the title. Perhaps in view of the greater commitment to league games, we did not enter the FA Cup. As it was, this was the final season in which we did not enter. The following season, we started the league campaign with a 3-0 home win against Atherstone, but then lost midweek at Aggborough in the Worcestershire Senior Cup. The second Saturday of the season brought Mount Hill Enterprise to Whaddon Road for an FA Cup game (XP). We won 2-0 with goals from Horace Payne and George Knight. Two weeks later, it was down to Bristol to play St. Phillips Athletic, and a Reg Smith goal gave us a draw and a home replay (which was played the following Wednesday, late afternoon  no floodlights then). Smith got a hat-trick as we won 5-0. So it was into 1Q, when Western League side Street came to Whaddon Road and lost 4-0. Then to Pennydarren Park, to play Merthyr Town. The former football league club, now playing in the Southern League had drawn with QPR in the previous seasons first round  Roy Hill and Harold Yarwood scored a brace apiece as we won 4-2. It turned out to be the Welsh teams last ever FA Cup match  they folded at the end of the season. Another Southern League club in Wales in 3Q  Llanelly, (they changed the name to Llanelli in 1960). A 2-2 draw in Wales (George Knight, Horace Payne) led to 3000 people at Whaddon Road on a Wednesday afternoon, (1st November, so kick off surely could not be later then around 3pm). Despite Harold Yarwoods goal, the Welshmen won 2-1. But that was not the end of it  the FA found out that Llanelly had played ineligible players in both matches, so Calne and Harris United made the trip to Cheltenham in 4Q. Calne were a relatively minor team, (playing below Western League level at that time) and had reached this round with a series of relatively local home wins, beating Devizes 3-0, Frome Town 5-2, Radstock 2-1, and Clandown 3-1. On the 11th November they met their match, with 5000 in Whaddon Road to see Harold Yarwood score four times, George Knight and Roy Hill two each, George Blackburn and Fred Hazard one each, as Cheltenham marched into the competition proper with a 10-1 win. Serious stuff now, even if it was a home match against non-league opposition. Barnet had won the Athenian League in both 1931 and 32, and were to reach the semi-final of the Amateur Cup in the following spring. Such a reputation seems to have been lost on Cheltenham, as Payne (2), Knight (2) and Yarwood led us to a 5-1 win, and then the longest trip imaginable  to play Third Division (North) club Carlisle at Brunton Park. If the majority of the 7347 crowd expected to see Carlisle win, then they were wrong, Cheltenham went home with a 2-1 victory, Reg Smith and a Bradley own goal doing the trick. So a club that had only win in 7 previous FA Cup attempts, now had 7 wins in one. All good things come to an end, though and Blackpool, relegated from Division One the following season came not to Whaddon Road, but the larger Athletic grounds, 10,389 came to watch, and Horace Payne who had scored the first FA Cup goal of the campaign also got the last, with Blackpool winning 3-1. The following season was to be the last with our first team in the Birmingham Combination, before we moved on to 50 years in the Southern League, we played only one more FA Cup game, and again lost at home. This time, at 4Q our opponents were Barry, and we lost 4-2. Early data from Tony Brown and www.thefa.com  post 1932 data courtesy of Keith Iles and Roger Knapp. There are few places where the line between Sports and Politics is more blurred than in the republic of Ireland. At the centre of this is the Gaelic Athletic Association. The association was formed in 1884, roughly the same time as the different sports organisations were being organised in the rest of Britain, (all Ireland being under British rule at the time), with the specific purpose of promoting games of Irish origin. The original intention was to re-establish an ancient sports event, the Tailteann Games and if this had stayed the main focus, Gaelic games would have become singular atheltics events, a cross between the common international athletics meetings and the highland games. However, the focus was soon changed to the two major Irish field sports, Football and Hurling, (Gaelic Rounders is also promoted, this is a sport much closer to the American baseball than the British rounders games you may remember from schooldays). As with sports in Britain, prior to organisation, there were a number of variants of any sport, with the rules changing from institution to institution. By laying down a common set of rules, it became possible for the games to move beyond single communities and for competitions to take place between different counties. Naturally, other areas of progress in the last 19th century also helped this progress  the development of transportation (the railways and better roads) to enable the teams to meet, and the changes to working hours bought about by the industrial revolution. It is worth noting, considering the directions the organisation took within 30 years of being founded, that one of the GAAs founding fathers was a capped International at Rugby, and a member of the Royal irish Constabulary, while another became the father of a cabinet member in theBritish government. As the question of Irish identity became one of nationalism and independence, so the GAA quickly became an organisation that not only shunned British sports, but actually legislated against them. The organisation was always unashamedly Catholic in nature, but would never prohibit members of other demoniations or religions from participating. Most games, anyway were played on Sundays, which has always ruled out the participation of those protestants who took their religion seriously. As early as 1886, the rules of the GAA banned members of the British military and the British Police forces in Ireland from taking part in Gaelic sports, a ban that was not lifted until 2001  and then only with much controversy in Ireland. Another rule banned GAA players from particpating in, or even watching other sports (this was lifted in 1971), while the ban on GAA premises being used for non-Gaelic sports lasted much longer. The words non-Gaelic really meant British, as the headquarters of Gaelic sport, Croke Park was used for a Boxing match in 1972 (Mohamed Ali won) and two American football matches in 1996 and 1997. The worst of all events at the stadium took place on 21st November 1920. On the morning of that day, a series of attacks by members of the Irish Republican movement, killed 14 British Intelligence Officers around the city of Dublin. 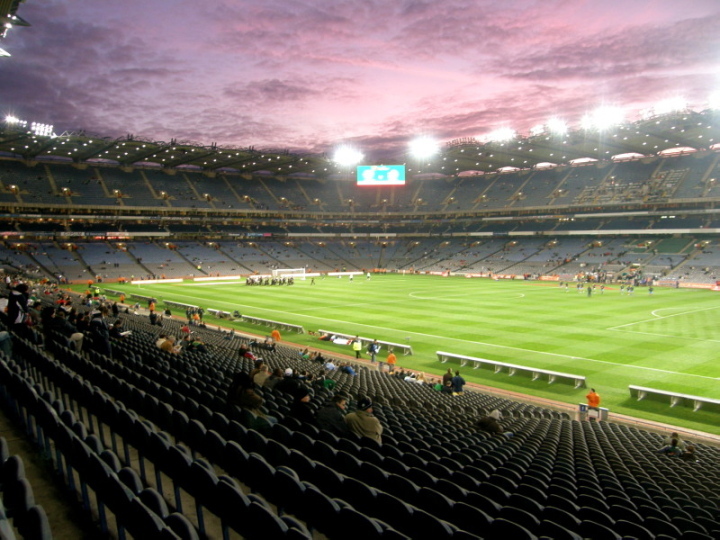 That afternoon, a football match was taking place at Croke Park between Dublin and Tipperary. Members of the British Armys Auxiliary division entered the ground and shot indiscriminately into the crowd. Thirteen spectators, and the captain of the Tipperary team, Michael Hogan were killed. The Croke Park of today is somewhat different to stadium of 1920. It was essentially rebuilt in the 1990s. The stadium today has three sides of a uniform, three tiered stand. These are everything that you would expect of a modern stadium. The upper and lower tiers present unhindered views of the pitch. Sandwiched between these are the VIP areas, business lounges, and the like. Sitting uncomfortably against this modern and concrete edifice sits Hill 16. A low slung area, which can still be used as a standing area for the Gaelic games. While most of the stadium sits under arching roofs, Hill 16 is open to the elements. While I was there, this area was converted to seating, and one small section of it was used by the away fans. Much of the cash for the modernisation of the stadium came from the public purse; so of course is the money for the rebuilding of the Landsdowne Road Stadium, the home of Rugby and more recently football in the Republic. The FA of Ireland has now given up its plans to have a big and expensive stadium of its own, and will go along with sharing Landsdowne Road for the foreseeable future. There is still a considerable volume of opinion that would not rebuild the old ground, currently a heap of rubble on the ground, and move all sports into Croke Park permanently  but that requires the same type of logic as would have been required to make Twickenham into London’s main stadium for all sports. (And do not forget that in addition to Twickenham and Wembley, an improbably expensive Olympic stadium is currently about to be built within five miles of Arsenals new Ashburton Grove facility, and yet both Spurs and West Ham are talking of starting fresh ventures of their own). It has taken a lot of political effort to get other sports into Croke Park. It was only a few years ago that the GAA voted against lifting the ban, and hence put an end to a proposed Celtic bid (Ireland, Scotland and maybe Wales) for a European Championship. Now a mixture of Government money, and a sum of over £1 million per match has persuaded the doors to open for other sports. Still the agreement is only a temporary one  the GAA have only agreed to five Rugby matches (two seasons worth of six nations championship matches), and four Football games (now all completed in the current run of qualification of Euro 2008). In fact, two more six nations series, and most of not all of the qualification for the next World Cup will have to take place before the new Landsdowne Road is ready. Assuming they accept these matches, there is a chance they could be offered the chance to play a major European club final in the city as well. On arriving at the stadium, a few things surprised me. One is the fact that GAA pitches are significantly larger than those for Soccer and Rugby, so the playing area is marked out on the middle of the green with a very wide expanse of green all around. Secondly the lower tier of seats are arranged not a direct rake, but a gently concave one. The lowest seats are down close to pitch level, but some 20 yards from the action. They also go into the corners, some 20 beyond the goal lines. The front rows of the lower tier are also far forward of the leading edge of the roof, so if it was a wet night, (as it happens, it wasnt), the spectators here would know about it. In a stadium like this, where the best views, (apart from the VIPs and corporate areas) were to be had from the upper tier, or at least the upper reaches of the lower tier, I suppose I should not have been surprised to find that only two price ranges existed, and by buying the more expensive tickets, I seemed to have been given the worst view in the house, (two rows back, lower tier and well behind the goal line). Fortunately, the ground was far from full  but this was the only time I have ever sneaked into the cheaper seats! As for the match, it was better than I expected. The opposition, Cyprus may be one of the lesser teams of Europe, but they came to the match to win, and played the ball around in a controlled and confident manner. The Irish on the other hand, played a game of hoof and hope, and rarely held onto possession for more than a couple of kicks. Cyprus really deserved to win, and went ahead with just over ten minutes to go. The Irish did fight until the end, and gained the equaliser in injury time. Even so, the crowd was making their displeasure known, and manager Steve Staunton took the blame for the result (part of a series that left them well short of qualification), and was sacked before the week was out. You are currently browsing the Football Shaped blog archives for November, 2007.